I've been designing Web sites profesionally for over a decade now. 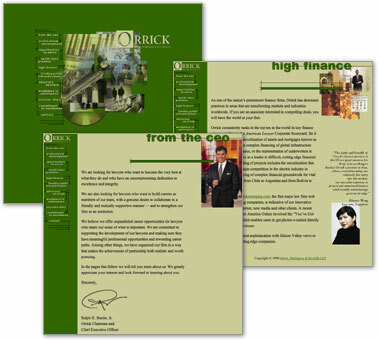 Here's some of my favorite corporate marketing projects. Project OnLive! Technologies developed virtual reality communications systems for online meetings and collaboration. 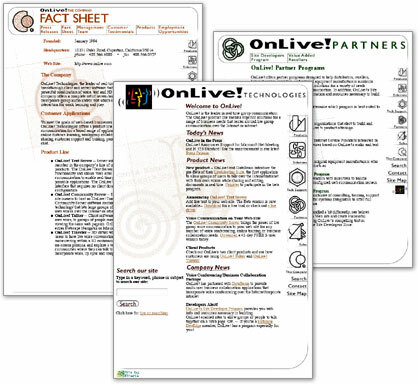 Etheria worked closely with OnLive's staff, who provided general art direction and back-end work, to build this Web site. I did the design and some of the illustrations. The bau-haus inspired look and feel became the basis for subsequent marketing materials and collateral for the software company. Project Synergy Business Solutions, a mid-sized software consultancy firm in San Francisco, came to Etheria wanting a very crisp, almost spartan design to promote their services. I used some first-generation DHTML to add just a touch of whiz-bang  some rollovers and dynamic menus that were very rare at that time. Note: the project was delivered unfinished, so some dummy text is still in place. Project I included this site in my portfolio even though I did very little of the actual work. It was the first  and still one of the few  projects where I was exclusivly the Art Director, not a designer or coder. I just said how I wanted it to look, someone else made it happen. Kinda cool.